I began writing seriously in late 2006. Since then, a plethora of trees have been sacrificed along my journey. *Laughs* Once I decided that becoming a better writer was something I wanted to commit to, I joined American Authors Association and the Historical Novel Society. The most helpful organization I joined was SCBWI (Society of Children’s Book Writers and Illustrators). I began attending local and international conferences. I attended workshops. I joined an awesome critique group. And even after all that, it took several more years to understand how to craft a saleable story. I’ve written probably ten full manuscripts. One I self published, but truthfully it never should’ve been published without further revisions and editing. The second manuscript I ever wrote back in 2011 finally got picked up by a publisher last fall in 2015 after multiple, heavy rounds of revisions. But the first traditionally published book, Drawn , was my ninth full manuscript written. As I said above, Drawn was my ninth full manuscript written. I thought it was an incredibly unique concept about a boy who gets sucked into another world simply by drawing himself into a sketchbook. Add a splash of romance to that… shake it up, and voila… Drawn. I finished writing that story in June 2014 and after consulting BETA readers and revising based upon their suggestions, I queried agents widely. *Crickets* No agent wanted it. But I knew I had a hit so I submitted directly to a small publisher that a writer friend of mine had used and they picked it up. I am so grateful to Evernight Teen for taking a chance on me. I am inspired by authors such as Laini Taylor, Suzanne Collins, JK Rowling, James Dashner, Kwame Alexander, Kristin Cashore, Jennifer Donnelley, Jason Reynolds from afar. Aside from them, I’ve worked with some truly amazing authors in my critique group, but I won’t list them here. There’s thirty or so of us. In a grander sense, I am continually inspired by anyone who has the guts to produce art of any kind, and put that work out into the world to be judged. Sketch artists, painters, spoken-word poets, musicians… I have much love for all of them, equally. Sometimes I begin with a character or set of characters. I recently sold a YA fantasy called The Sky Throne to Month9 Books. It’s due out spring 2017. With that story, I began with an ensemble of six characters. 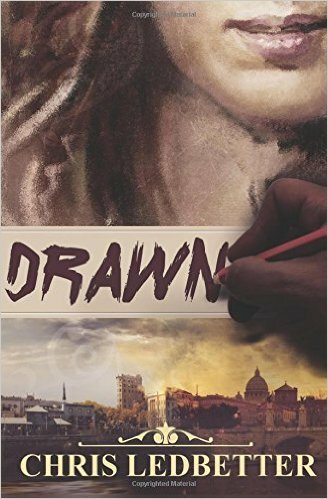 For Drawn, I began with the story concept first then dropped the characters into that madness. I have a worksheet that I really love that I got from Martina Boone. It helps me think about the character from a lot of angles. When fleshing out a character, it’s important to give them quirks and flaws and really think about the small details that make them unique and the particular ways that the character would view their world. I like to think of my new/ contemporary writing style as conversational. My historical writing style has been described as lyrical and sort of like it’s being told by an old sage telling stories around a campfire. Typically once I get into a story, I will plot all the major narrative points out. Then I’ll write by the seat of my pants from one plot point to the next. Many times, twists and turns arise, and I just roll with them. Angela Brown, author of Beacon. GL Tomas, author of The Mark of Noba. Nnedi Okorafor, author of Akata Witch. I love the We Need Diverse Books movement. I would love for the kidlit industry to reflect the demographics of our world. I want to see more POC main characters and to also have them reflected on the covers. This is important for youth growing up… to be able to see themselves on book covers. And they don’t all have to be “issue books.” Romance and romantic comedy books featuring characters of color in a widely distributed fashion should be the norm, not the exception. Find out more about Christopher S. Ledbetter here. Love what you all are doing here. You’ve introduced me to some writers I knew about, but many I didn’t. Loving the up-close looks at other writers. Thanks for the hard work. Found out about you via Twitter/WNDB. Whaaaaaat? I missed the entrance of another AfAm MALE YA writer? Must run and make up for that lapse! Thank you for introducing another author I didn’t know.